The holiday season is in full swing, and many people are preparing for trips to celebrate, worship and break bread with family and friends. We hosts are starting to think about our menus, while guests are planning a dish or two to present for everyone to share. Holiday meal classics are the usual choice for many, and in the South those can include traditional comfort food dishes such as ham, macaroni and cheese, collard greens, and pumpkin pie—to name a few. 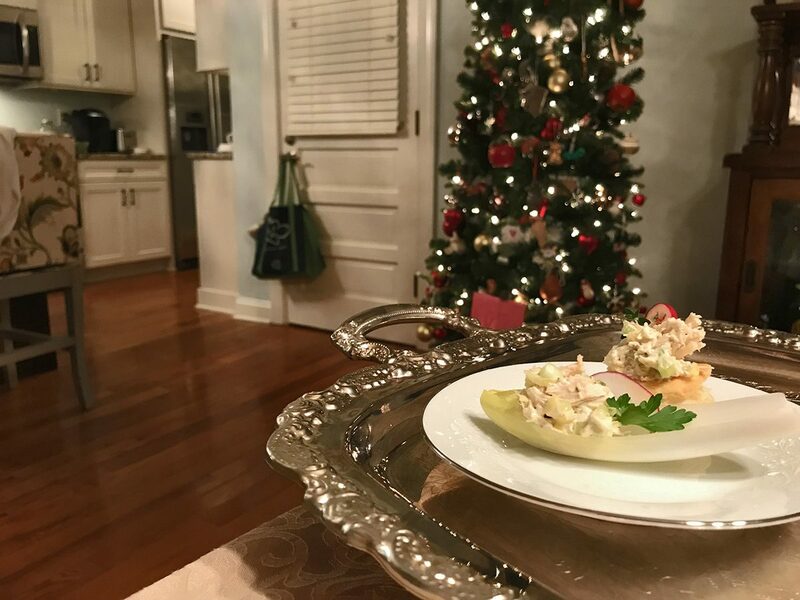 But since I’m a chicken salad aficionado, I will focus on what we can do with a classic chicken salad for the holidays to give it a festive and appealing appearance while creating a memorable savory experience. Your chicken salad will be a hit around the table. And you won’t be coming home with any leftovers! Chicken salad begins with a (drumroll…) chicken! Roasted, baked, boiled, broiled, slow cooked, pressure cooked or even sous vide. Season to taste with salt and pepper. Depending on the texture you desire, it can be shredded, chopped or diced. Add celery and onions if you like. Mayonnaise is a must, with perhaps a hint of Dijon mustard or salad dressing. And voila! You have the makings of a classic chicken salad that should satisfy most any palate. Of course, we can get a little more creative and add other ingredients—pretty much anything that works well with mayo and chicken, which is just about everything. Well, save the peanut butter… for some peanut butter fudge! And I haven’t gone so far as frying chicken salad, but maybe that’s an idea for next year’s North Carolina State Fair, where you can find fried anything! Jazz up your chicken salad for the holidays. Here are a few ideas to add that “WOW” factor in both appearance and taste. First, I personally like to use local and seasonal ingredients to the extent possible. Although, December and January are not the best harvesting months you can still find some interesting products at your community farmer’s market or local supermarket. Starting with the basic ingredients above, I like to add some color and crunch to chicken salad for the holidays. You can really mix in almost anything, but here I’ll stay with the traditional colors of red and green. Any colors that may brighten up a dish can work… just make sure it’s natural—no food coloring. Be creative! And don’t forget the garnish. Now let’s talk about nuts. Nuts are in abundance during the holiday season, everything from chestnuts, almonds, walnuts, pecans and macadamia nuts. I wouldn’t recommend adding almonds unless they are super finely chopped. You can experiment, but in the South you’ll never go wrong with pecans! Adding any the above to a chicken salad will definitely bring some color, flavor and texture. I will leave the combinations and amounts to your imagination and taste preferences. To take it up a notch, I would suggest serving your salad on a bed of red or green lettuce, kale or even red cabbage. Consider garnishing with some of the above ingredients, even if you didn’t add them to your recipe. For instance, sprinkle some paprika over the top, scatter a handful of pomegranate seeds or sprinkle chopped fresh herbs. The possibilities are endless. These are some easy and quick suggestions for the holidays to make your chicken salad stand out from the crowd of dishes around the table. Be creative and different… all year long! And have a happy and safe holiday season!